Once you’ve finished at the hotel, take a short limousine ride to the St. Joseph’s Catholic Church, located only a few minutes away. Here, your photographer can create an intimate portrait of the bride and groom in front of the wooden doors of the front entrance. The members of your bridal party can also pose against the exterior limestone walls for some great contrasted photos. There are also a number of large tall shade trees around the perimeter of the church that will work great for individual photos. Have your wedding photographer assemble a group photo in front of the church, using its gorgeous Gothic architecture as background. Finish off your wedding day photo shoot at Detroit’s Gabriel Richard Park. Located on the bank of the Detroit River, the park features a beautiful riverwalk, where the bride and groom can take a promenade as your wedding photographer snaps some candid photos. The bridal party can also pose for seated photos on the numerous benches scattered along the riverwalk. Finally, take some photos on the Belle Isle Bridge, against the backdrop of the sparkling river and the Detroit Skyline. For some truly distinctive wedding photos that you’ll find in few other wedding albums, have your photoshoot at Detroit’s abandoned Michigan Central Station. This magnificent building has fallen into a state of disrepair in last few years, but the setting remains a favorite spot for photographers to work with. Begin by using the station’s exterior as a stunning stage – have the bride and groom pose beneath one of the arched entrances for a private portrait. The groomsmen and bridesmaids can also pose beside one of the towering Corinthian columns outside the station. Once inside, your wedding photographer can create some amazing silhouetted photos against the huge station windows. Your photographer can use the entirety of the station’s gigantic main lobby for photo ops, with its huge columns, marble benches, and high ceilings. Once you’ve finished inside the station, walk over to Roosevelt Park across the street from the station and take some photos on the park’s giant lawn. Members of your party can also pose beneath the large shade trees for individual photos. For a finishing touch, have your wedding photographer assemble a group portrait on the park lawn with the train station in the background. To conclude your photo shoot, head over to the Ambassador Bridge, just over a mile away from the station. Have your limousine driver take you along this iconic bridge, overlooking the Detroit River. Afterward, the bride and groom can stroll along the bridge’s sidewalk as your wedding photographer takes some snapshots. The bridal party can then take a group photo along the ledge of the bridge, with the glimmering water below. There is no place better to capture the spirit of Michigan’s capitol then Hart Plaza, located near Jefferson Avenue by the riverbank. 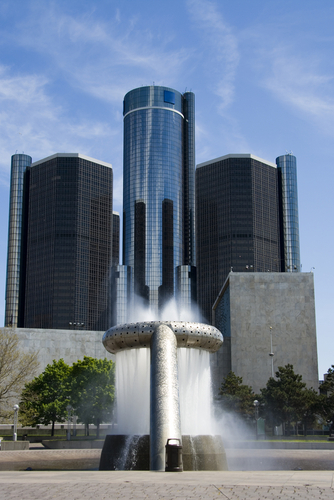 Hart Plaza is the site of numerous city functions and festivals and is renowned for its iconic sculpture works. Have your wedding photographer organize some photos of your bridal party beside the plaza’s famous arch, built as a monument to the state’s labor movement. Next, the members of your bridal party can pose for some group and individual photos by the Dodge and Son Memorial Fountain, the centerpiece of the entire plaza. Take a tour of the plaza, itself, and pose for photos with the area’s surrounding skyscrapers serving providing a unique urban setting. Famous landmarks include the Joe Louis Arena, the Cobo Center, and the Renaissance Center. Take advantage of the benches around the perimeter of the plaza, as well as the grassy areas and trees, to create some more casual photos for your wedding album. Afterward, take a short drive over to Cass Park, situated about a mile away from Hart Plaza. Here, the bride and groom can take a leisurely stroll along the park’s pathways as your photographer captures some photos. The park’s numerous verdant trees will provide a great setting for your photographer to work with, as will its historic statues, lush green lawns, and cozy benches. This is a perfect spot to conclude your wedding day photo shoot in Detroit!